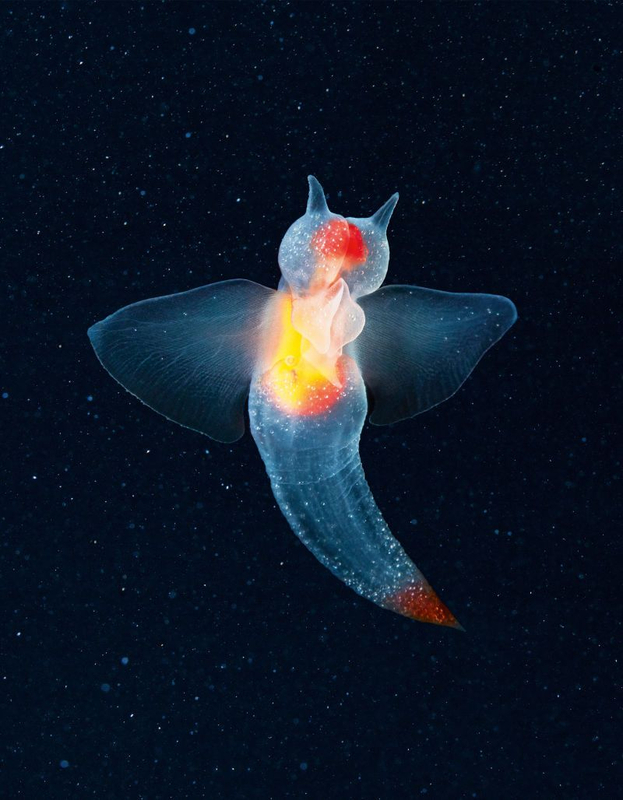 At number one we have an early alien penguin. This won’t appear in the DLC and I’m not really gonna miss it. I’m not exactly getting a penguin feel from it. At number two, the return of the pinnicarid! Turns out we will be getting the black one! It’s got some alternate color schemes, all of which are nice, and I’ll be happy with whatever one they choose for the DLC. And finally, we’ve got a new creature! 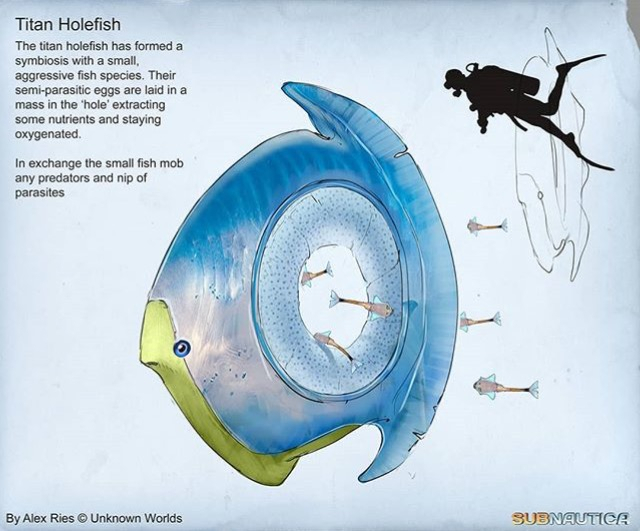 Meet the Titan Holefish, one of the weirdest (and coolest) creatures being added to the expansion, IMO. It’s biology is incredibly bizarre and seems to be something like an ocean sunfish mixed with a cuckoo’s victim, yet they’re symbiotic! Can’t wait to see these guys drifting about the Arctic seas. I'm hoping for C or D. Also, the Pinnicarid is SO CUTE. 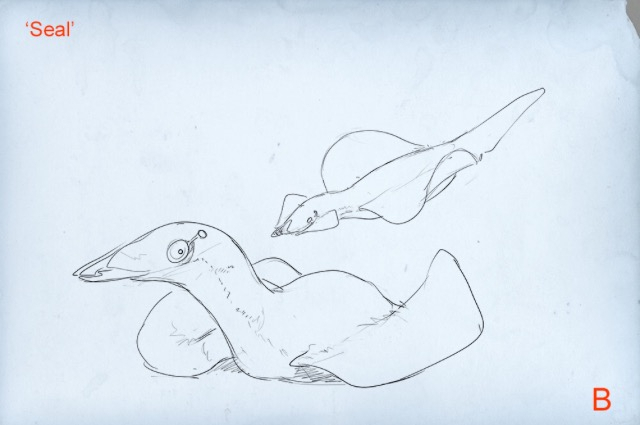 This game has a history of cute creatures. Until they open their jaws at least. Eh. 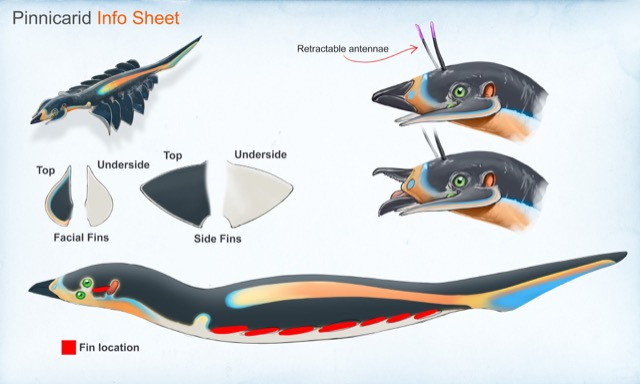 I have a soft spot for creatures from the Cambrian period. Like Anomalocaris, or Opabinia. 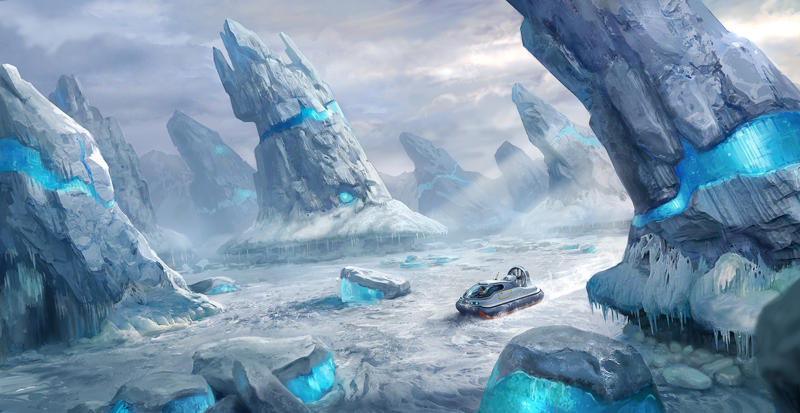 We just got a BUTTLOAD of new concept art, much of which is going unused. Since there is so much I won’t put my opinions on each for now. 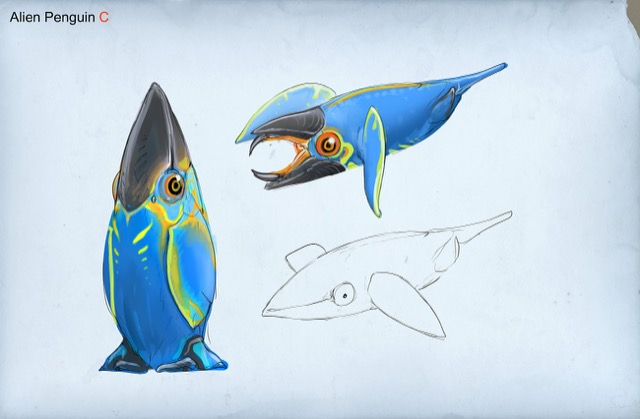 These are some unused concepts for the alien penguin, and they confirm the mysterious blue creature is in fact an old alien penguin. 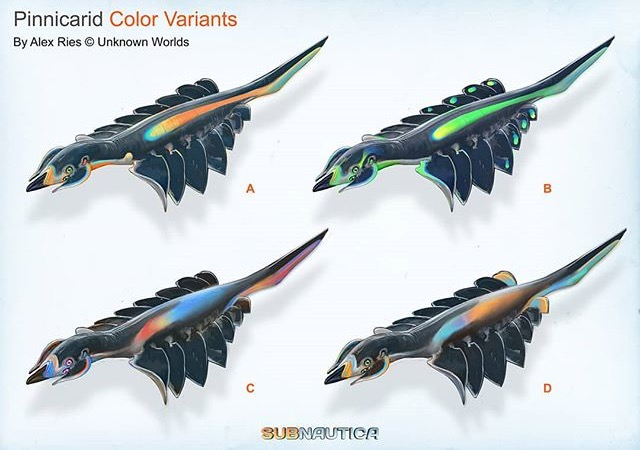 All of these are very nice, and it’s a shame we won’t get them ingame. This is an old sketch of the pinnicarid. Nothing too interesting. 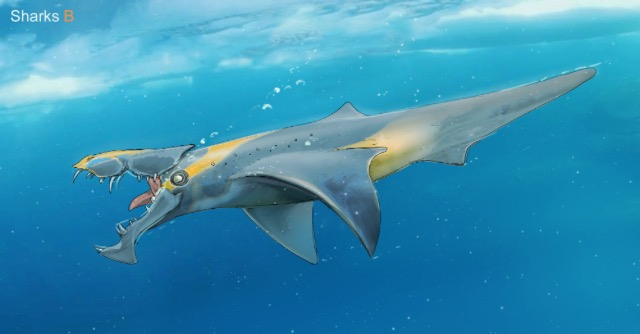 Here’s an old squidshark. Not too different, but I definitely prefer the new one. 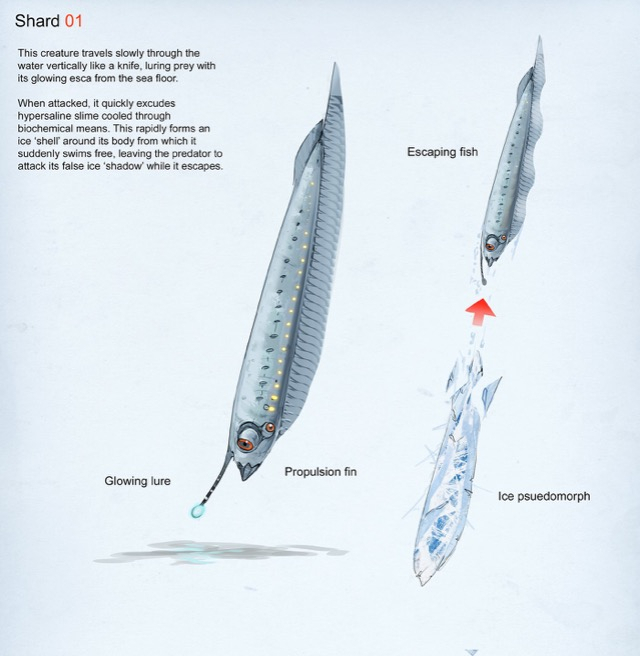 This is a creature only known as the shard, which is like a bizarre knifefish that uses ice like squid ink. 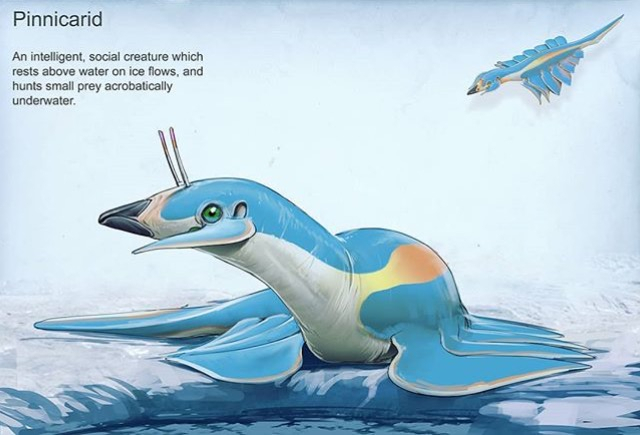 It’s a shame we’re losing such a fascinating creature, but I would imagine that ice dummy ability wou be difficult to animate. 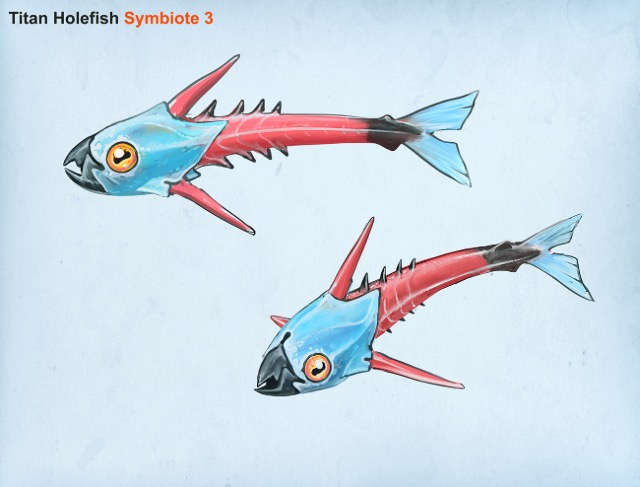 Here’s a closer look at the Titan Holefish symbionts. They’ll be fun to place on the taxonomic chart. This awesome beast is called the Brute Shark, and it’s a stalker/boneshark size animal. 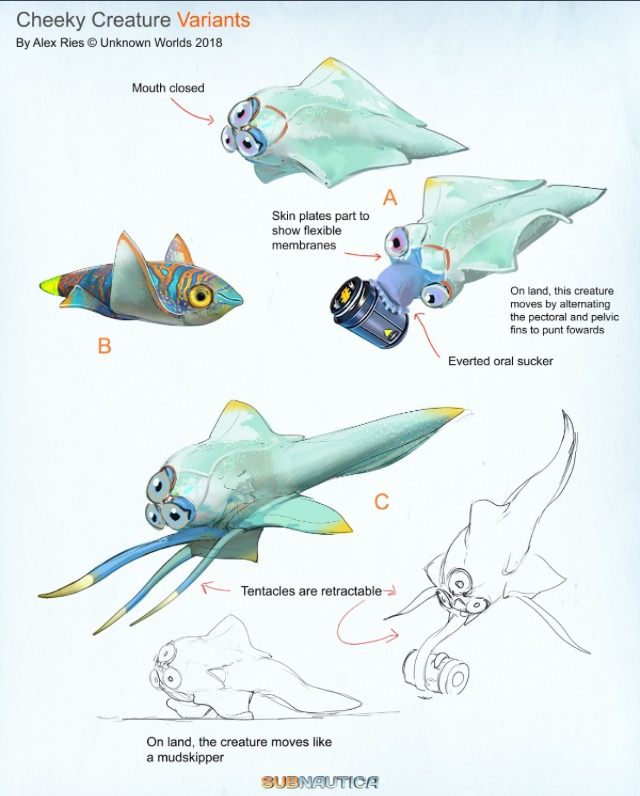 It may have been replaced by the squidshark but I certainly hope we get both of them. Here’s some anatomical details on the pinnicarid. 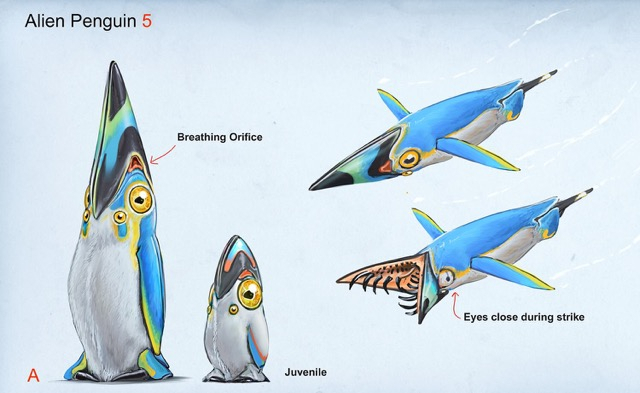 This seems to confirm we’re getting pinnicarid A (new set of patterns)/pinnicarid C (original pattern set) It has neat anatomy, and for once it’s mouth isn’t terrifying! 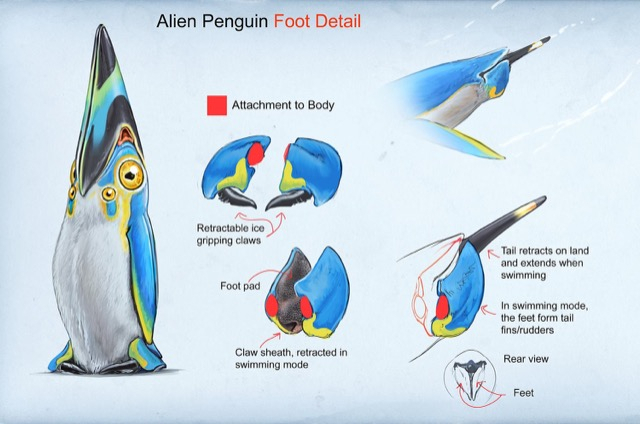 Here’s some details on the final alien penguin. I’m glad we can finally see how it’s feet work. Ok random idea I wonder if the precursors are gonna be there to.. Bit late to the party, eh? 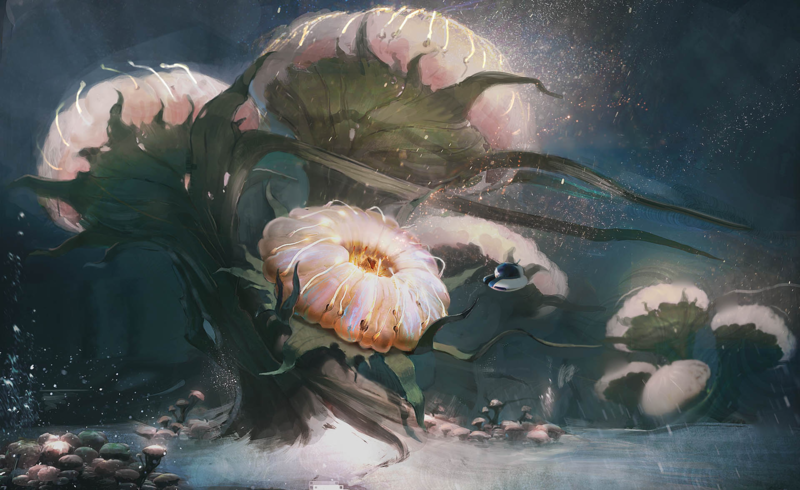 I SERIOUSLY hope we get something akin to a sea angel, those things are really cute and giant ones in an alien containment? Heck yeah! Might be just now realized it was a thing but oh well. @kingkuma: It may be fan art but it still would be awesome if it ever came tot the game. @RowletAlex: How do you place the pictures, I mean I try to do it but every time a link shows up and I can't post it? Pls help me. New piece of concept art! 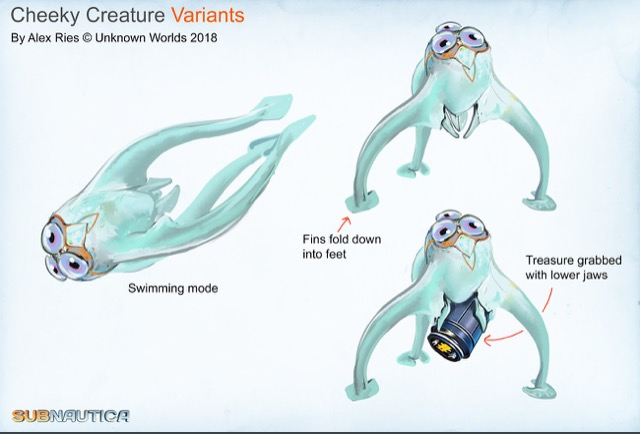 This is of a “mysterious” creature for the expansion, by Pat Presley (unlike the rest of our creatures so far) What it’ll do I’m not sure but it looks weird and I’m really excited to see it ingame. @millievdb I use mobile so this might not work the same, but there should be a little photo symbol above the text box where you write your post. Click it, choose an image, and it should automatically put the photo in for you. 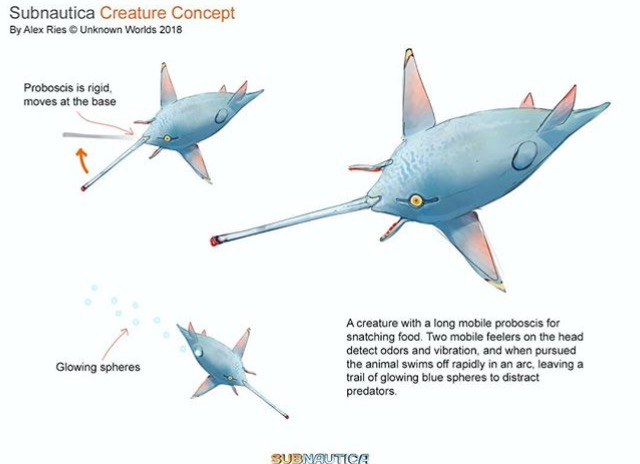 @RowletAlex that looks like something off of Spore. Evolution truly WAS a mistake. 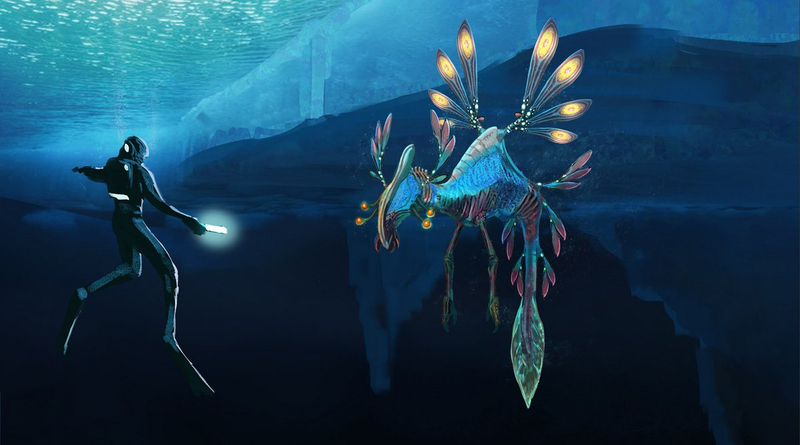 Well it’s official according to wiki the artic “dlc” expansion is actually going to be a separate game and Subnautica it self will not be needed to play. Huh. I looked into it and apparently this is a thing but it’s somewhat poorly worded, so I’m gonna need some clarification from a dev on that. To be quite honest what I think Obraxis was trying to say is that it’s not expanding the base world and will be truly, wholly independent. They or another dev can correct me if I’m wrong. Additionally, I really don’t understand the point behind a second game entirely if it won’t be drastically, hugely new with big new features. I’d be fine with it but I KNOW loads of people would whine that it doesn’t have multiplayer or something else significant different. It’d be peppered with reviews saying “this could just be an expansion for the base game” or something like that. Just my 2 cents. EDIT: So I asked around on discord and got numerous responses (including from Obraxis) that it’s a separate .exe file that can be played without the game, but isn’t quite a sequel or a truly separate game. 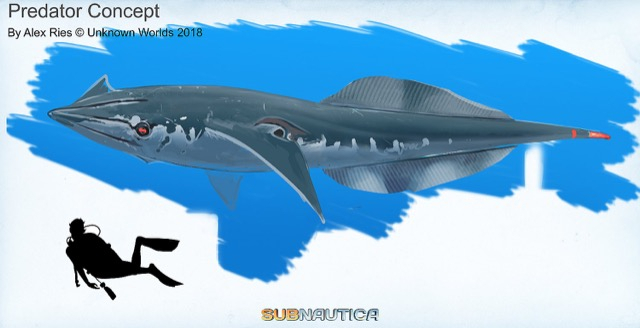 You can buy it without owning Subnautica, but it’s not a whole new game. 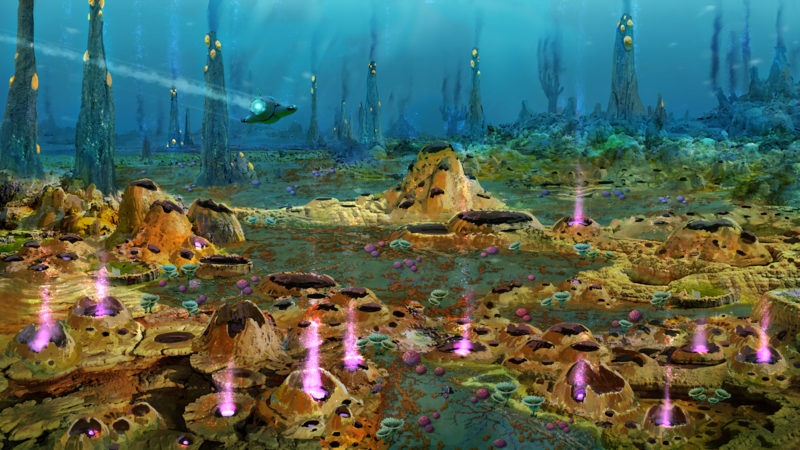 Think of it as Subnautica 1.5. Not everything benefits from following trends. DLC is a huge trend because it is easy to push "new" content for a "small" price, incurring in huge revenues for the gaming companies and negligible content for the players. Once upon a time, expansions were a new thing and the norm was to publish games in sequence. Game, Game 2, ..., Game n and so forth. When Doom 2 came out it only featured one new weapon, a few new enemies, practically no new mechanics and a ton new levels (mostly using the same sprites and textures, only different mazes). It was a huge success and launched only a year after the original. Having new things just for the sake of new things alone isn't ok. Trying to appease everyone also tends to fail. 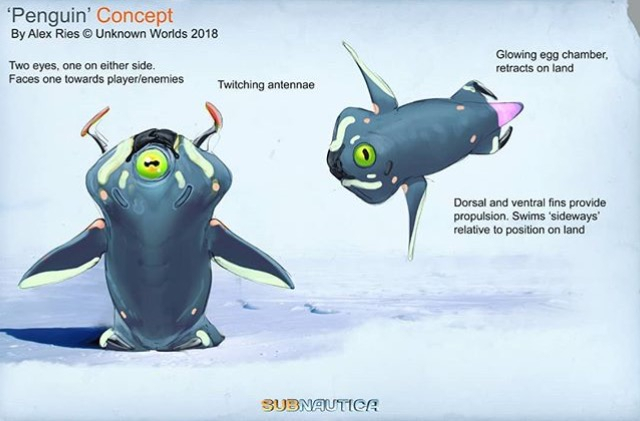 Subnautica has its own niche, there's still a huge demand in this niche and UWE is lightyears away from the competition. Right now it would be foolish to waste time and resources on anything not guaranteed to improve the game, and there's plenty of assured improvements to be taken on what's already implemented. You DO have a very good point there. I myself wouldn’t complain but I know other people would (the same people who ask for multiplayer/weapons I would wager) However I’m rather satisfied with the state of the expansion as it is now. I’m really looking forward to playing it! 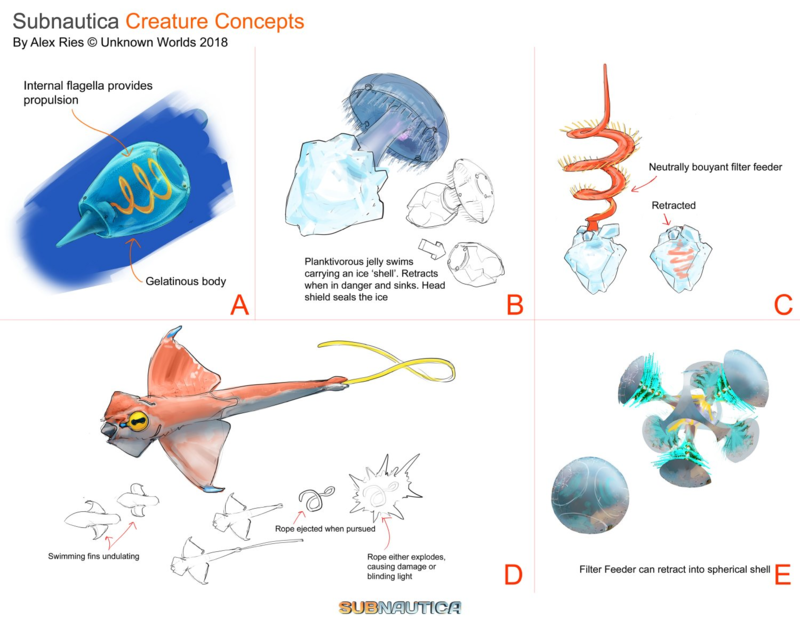 A couple new fauna concepts I haven't seen posted here. 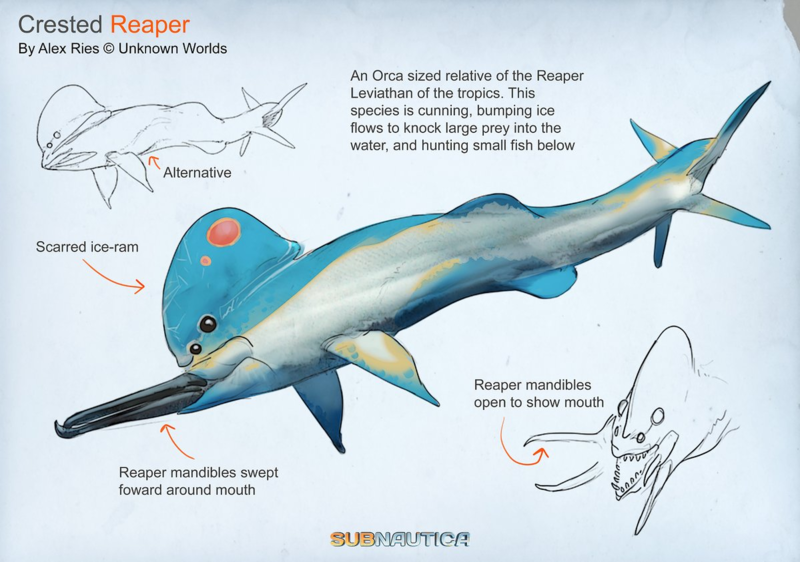 This first one is of an unused Reaper relative. This second one is of various small animals. It's unknown if any of these are scrapped or not. There are also a couple new biome concepts. The first one is of the Arctic Spires biome which will probably make it in. The specific hovercraft visible here won't make it in, but something to fill that same role will. This second one is of a Thermal Zone that will be making it in from the looks of it. 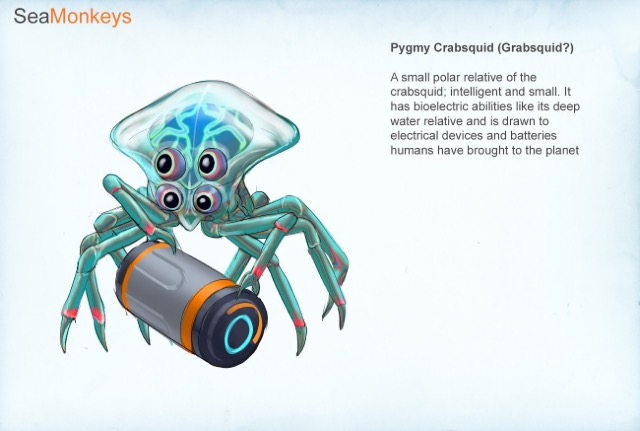 Bear in mind that the Seamoth likely won't make it in. I was literally just about to post those! The assorted small fauna one is new to me, though. I don't understand, why wouldn't the vehicles that we have now get into the expansion? Would they entirely remake the subs for the arctic? And better question is why? I would expect at least one of the current vehicles to continue on. Supposedly the PRAWN is probably gonna stay, but I suppose they either want it to be more terrestrial this time, or they’re going to add two new submarines to replace the old ones. And then there’s the terrestrial Hovercraft vehicle as well. Which begs the question, what functions with them?